he Artisans are an exciting medieval band . Formed of musicians from diverse backgrounds in folk, world and early music, they bring together a broad experience from different genres. This has helped them to create fresh and exciting interpretations of this ancient music, whilst still remaining historically informed. With exotic dance tunes to rousing choruses, their playing aims to enchant all those who hear them. The Artisans have performed at a variety of venues across England including Buckingham Palace and Brighton Pavillion. From festivals and concert series to music clubs and societies, the Artisans are a very flexible ensemble with portable instruments that can adapt to most spaces. They only require two seats and one stand, as most repertoire is performed from memory. 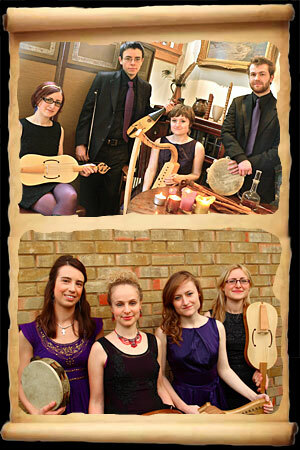 Their range of loud and quiet instruments means that they can provide programmes to suit inside or outside performances. The Artisans are at ease on stage, playing tunes and songs with energy and enthusiasm, aiming to win over the most sceptical of audiences. Performing on a range of fascinating instruments including recorders, bagpipes, vielle, harp, rebec, symphony, oud and a variety of percussion, this is a band to look out for! Copyright © the Artisans. Site build & maintenance, Dave Baker.